7’2 3/4″ Malibu style hull, volan, wet sanded gloss, single Bahne box. A real fun board to just stand in the middle and carve to your hearts content. A little more forgiving from the tail to boot. 7’11” hillbilly glider, 6×6(6), pond scum green bottom/clear top, Fins 101 bamboo glass on, gloss and polish. One of my fastest shapes. Get in early, and GO! The biggest waves I’ve ever surfed have been on mine, but I’ve had a blast gliding into them at knee high as well. A bit of a handful at the beach breaks unless you’re used to a longboard. Came across these photos and put them up just because I like them. 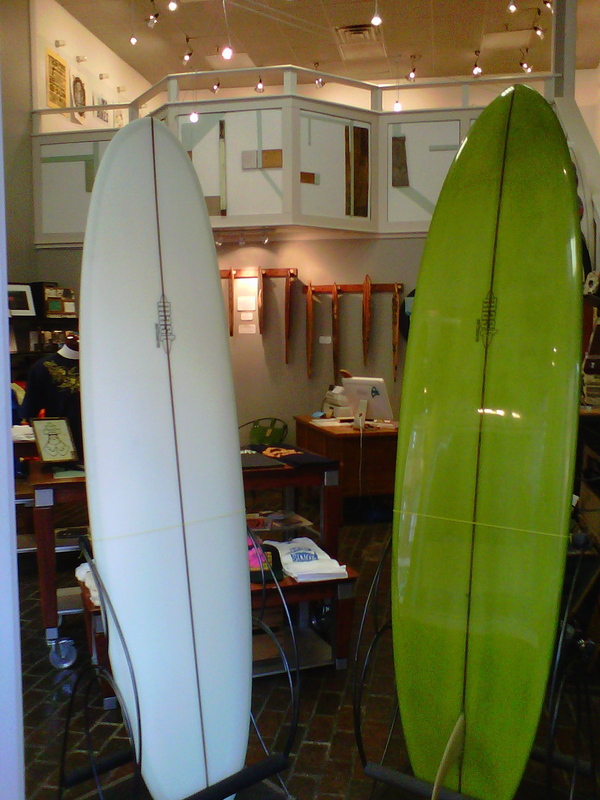 I’ll be bringing these two boards, plus my personal 7’3″ hillbilly hull East next week. The mango one is a 6’10” hillbilly hull. This board is a blend of Liddle style Malibu hull with a bonzerish, Frye style mid to tail contour. Step forward and drive it like a hull, but step back and feel the drive and projection of a bonzer. The gray one is a 5’8″ HPH/speedster. Based on the Bob Simmons/Lindsay Lord hydrodynamic planing hull concept, but foiled out and dialed in for speed. I’ll be showing these to the friendly folks at Cinnamon Rainbows and Corduroy over the weekend so if you’d like to get a closer look, contact me and I’ll let you know where and when.